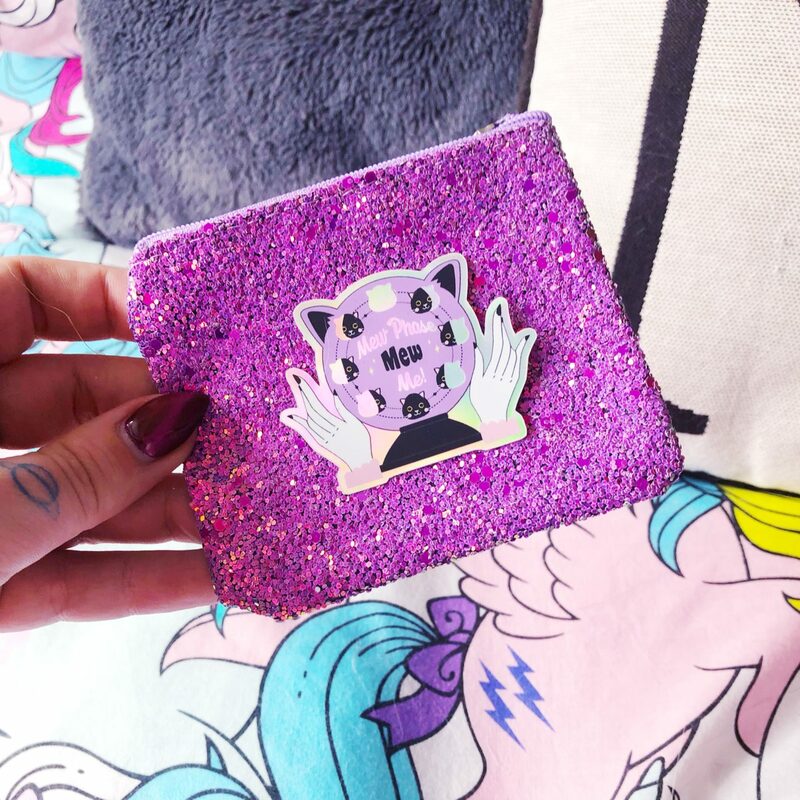 I was recently very kindly sent a Meow-gical Box to review! 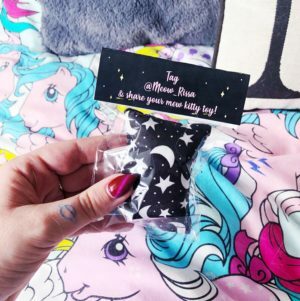 The Meowgical Box is a cat themed subscription box created and sent out by Marissa (who also created MeowRissa where you can find a range of cute handmade items including jewellery and more). 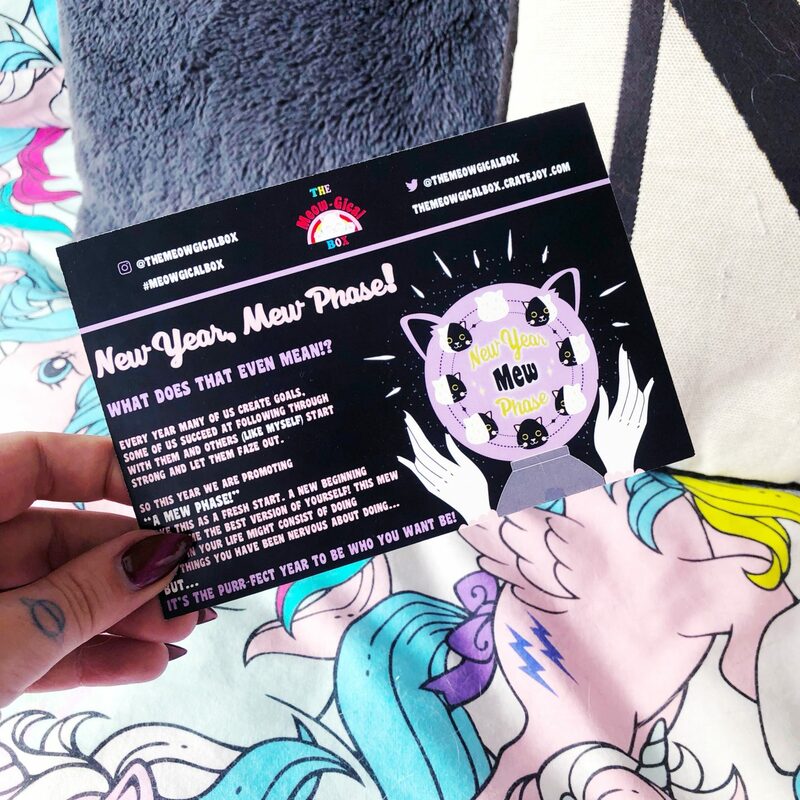 There will be 4 new Meow-Gical Box’s a year with a completely different theme! These surprise items in the box may not be entirely for your furry friends but mostly for the cat moms and cat dads. Why? because YOU DESERVE IT! These boxes can vary from all sorts of things, ranging from pins, patches, stationary, and jewelry. We work with many independent artist who put so much love into there product. Everything is handmade or designed by our featured artist. You will never know exactly what you will get in these boxes, but there will always be a guaranteed kitty accessory in every box. For every box purchased, a donation is made towards the Los Angeles Kitten Rescue as well, which is brilliant. 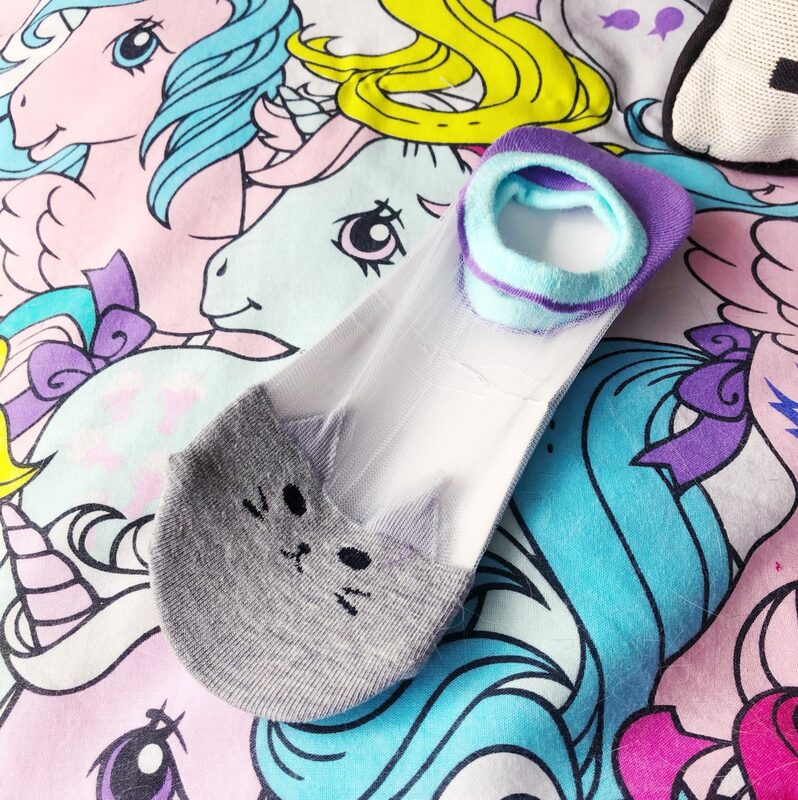 It is delivered quarterly and contains surprise, handmade cat themed items. The subscription service to Meowgical box will cost you $32.99 (approximately £25.00) and you can buy one off boxes for $35.00. So what did I get in my box? The box I received was New Year, Mew Phase and shipped at the end of January. The box itself is really sturdy, it wasn’t at all damaged considering it’s rather long journey from America. It is made of cardboard so completely recyclable. The box is rather cute so you could repurpose it for something else as well if you wanted. The first item I pulled out was a card introducing the box and the guest artist. I love the illustration on the card – it matches the box and introduces the them nicely. 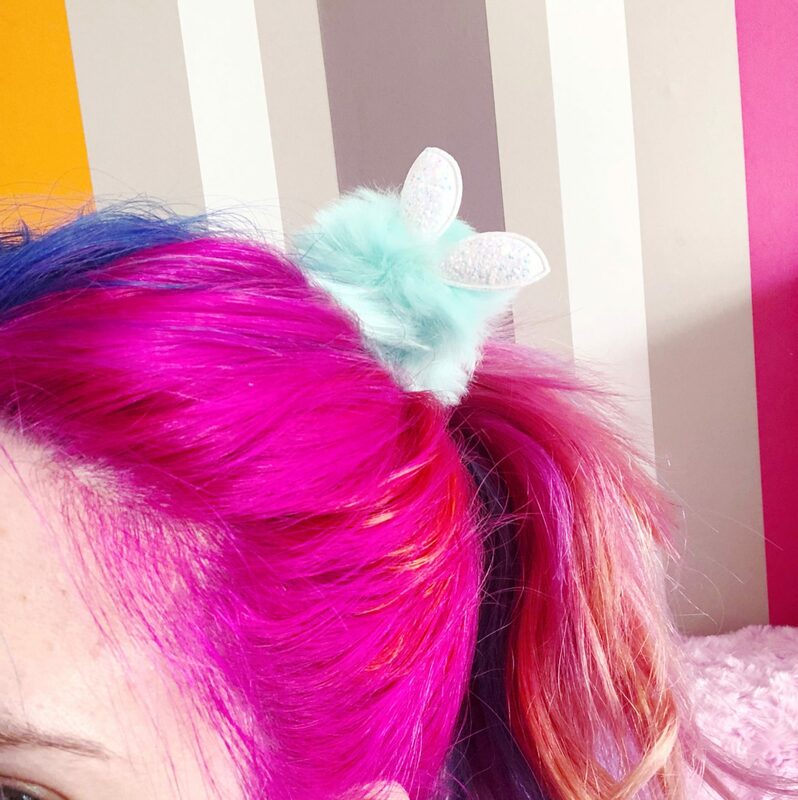 I love the faux fur pom pom hair bobble! 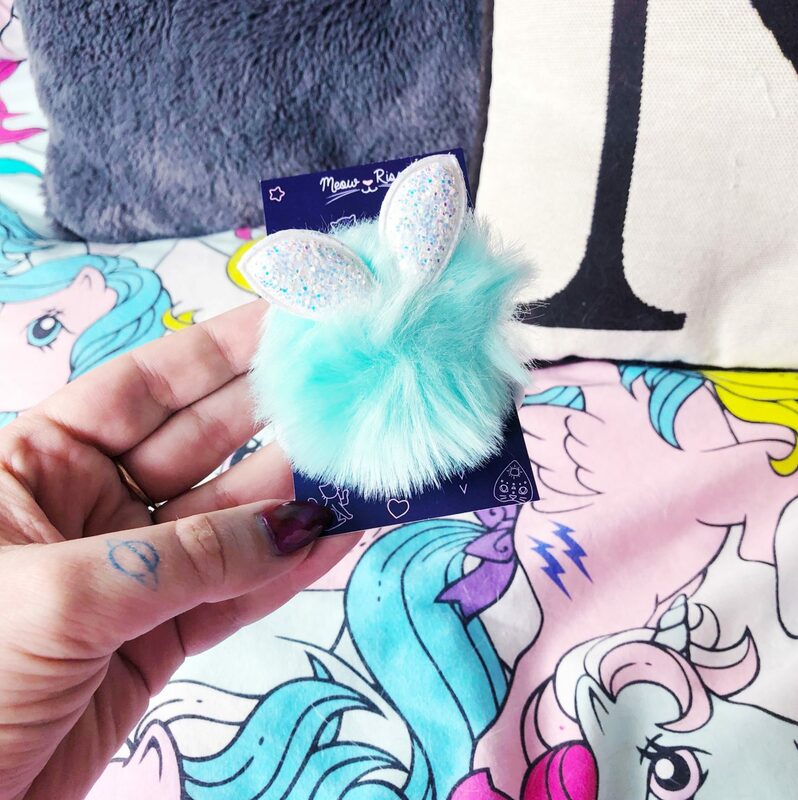 It has sparkly ears and is the sweetest mint green colour. It compliments my hair very nicely! Next up were some little kitty socks. I think these might have been my favourite thing in the box. They are like little trainer socks and have cute cat faces on the toes. The contrast trim in purple and mint are really lovely colours as well. They are the sweetest socks ever! Next up was a little purple sparkly purse with the same illustration as the front of the box. It has a zip opening. I always find these little purses really useful for sticking in the bottom of your handbag. The fact that it is sparkly is obviously a massive bonus! 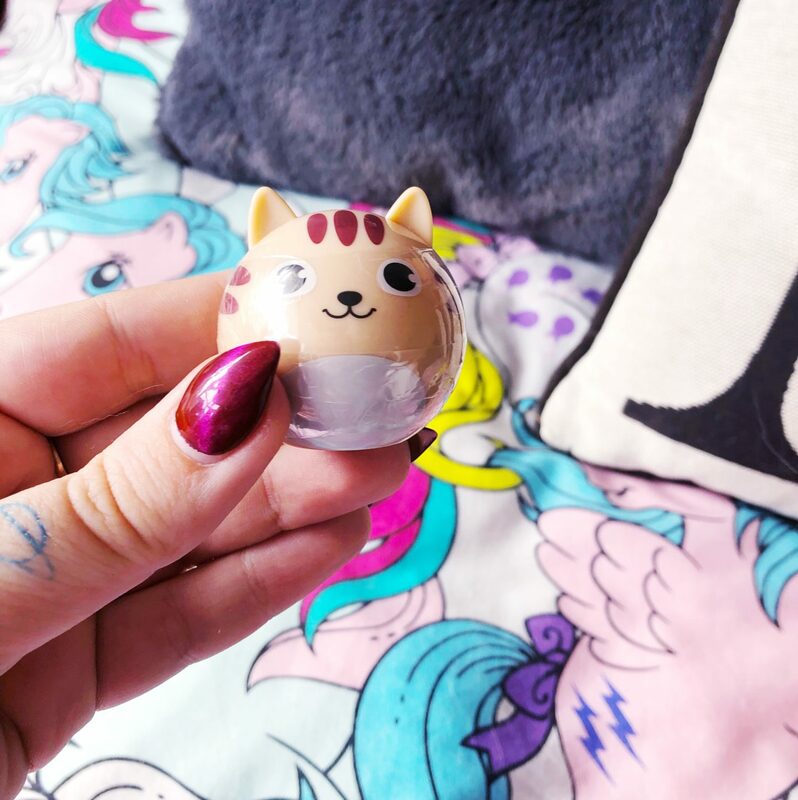 I think this little cat shaped lip balm is adorable. It’ll be going into work with me so it can keep my lips smooth and look cute on my desk! Next up was a beautiful card created by the guest artist for the January box. Designed by One of A Card, a Los Angeles based greeting card company, it features the cutest design. It came with an envelope so I will be sending it onto a friend very soon! The last item in the box was a big hit with Mallorie – it’s a cat nip toy and she was very helpful whilst I was opening the box so I gifted it to her. She is now asleep with it on the bed! It’s well made and a good size for her to easily play with. All in all, this is a lovey subscription box. Everything in it feels like it has been created with love. It is all beautifully made and designed and feels like a real treat. Perfect for the cat lover in your life and the fact it often contains an item for that, means it’s also perfect for the cat in your life! It remains to be seen whether Mallorie will share the January treat with her brother and sister. 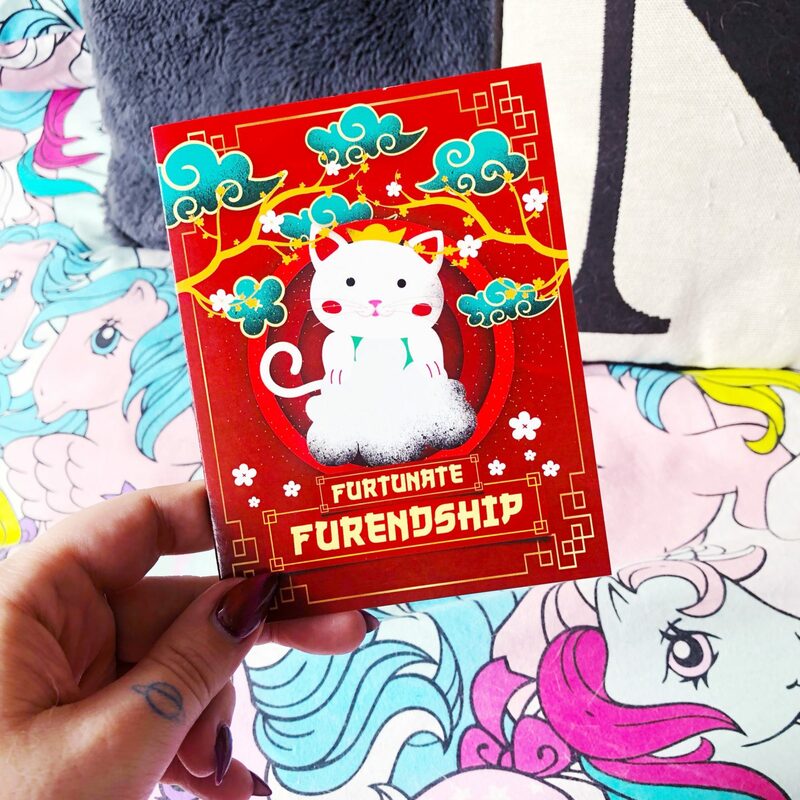 You can treat yourself with 10% using the code THANKMEW! I’d like to say a huge thank you to Meowgical Box for sending me the January Box in exchange for this review. 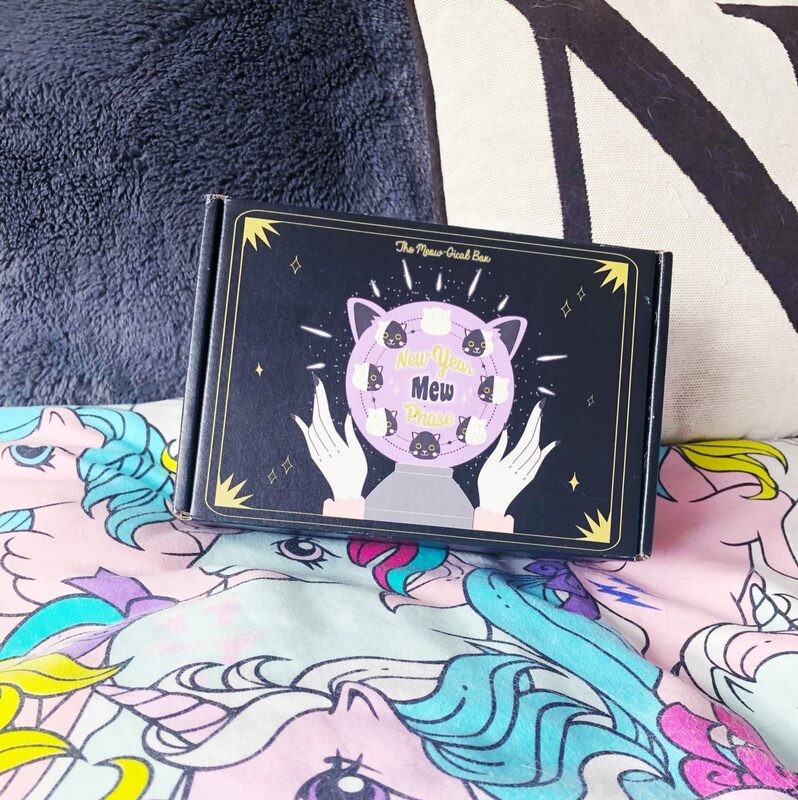 I loved all the cat themed items in it and I especially love the creativity and passion that goes into each box. 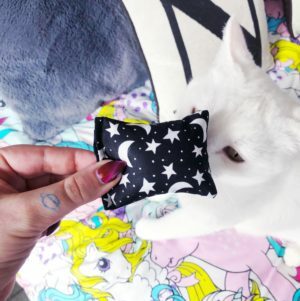 You can find Meowgical Box on Twitter, Instagram and by heading to their website here. Do you have a favourite subscription box? Do you think you’d try this one? Get in touch below. I was really impressed with how the box held up on its long journey! I don’t know if the socks were home made – I’d guess not after having worn them the other day but they are seriously cute! Thank you! It is such a sweet box – I love stuff like this and its so great that they donate to cat rescue! When I opened the lip balm – it was pink and sparkly too!